On a treacherous ledge just outside the entrance of Boston Harbor. Can only be viewed by boat. Minots' Ledge is a narrow ledge that is covered over in high tides. In 1847 a survey showed that at least 40 lives were lost at the site from dozens of shipwrecks on the ledge. Minot's Ledge is known as the "I love you" light, named for its 1-4-3 flashing pattern. The original lighthouse took three years to build from 1847-1850, and was built as a lantern perched on a skeletal iron tower so as not to be blown over by the strong winds, so the engineers believed. It was lit on January 1, 1850. 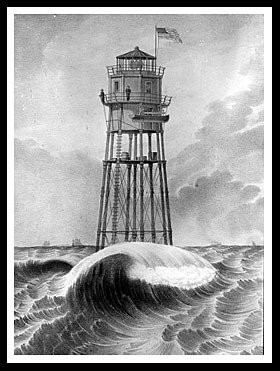 When the new lighthouse was built, the first Keeper Isaac Dunham complained of the unsafe conditions of the wave-swept ledge and the constant shaking and swaying of the tower. Even his cat went crazy and jumped off the tower to its death. He quit after only nine months on duty. Dunham's replacement also complained, and in April 16, 1851, the tower was destroyed by huge tidal surges and waves from a one of New England's most powerful nor’easter storms, killing the two assistant keepers, Joseph Wilson and Joseph Antoine, on duty. Wilson's body was found washed ashore while Antoine made it to shore, but died of exposure. Becuase of the destruction of lighthouse the storm was given the name the "Lighthouse Storm" as appropriate for the history books. There are still paranormal sightings and sounds coming from the lighthouse believed to be the two assistant keepers watching out for mariners. A light ship was brought in temporarily and new construction began in 1855 of a stone tower made of granite, hailed as the greatest achievement in lighthouse engineering. Construction took time as many construction workers were swept off the rocks by the pounding waves, even at low tide. For safety reasons, only workers who could swim were allowed on the project. Two years later during the construction, the ship the New Empire crashed on the rocks and destroyed most of the lighthouse. The lighthouse was finally completed three years later in 1860, as one of the most expensive lighthouses to be built in the nation’s history. It is still considered to be one of the top engineering feats of the old United States Lighthouse Service. Note: The bell from the original Minot's Ledge Lighthouse that was destroyed in New England's most devastating storm now rings from the tower of the Bryant Pond Baptist Church in Bryant Pond, Maine. Cohasset is a friendly coastal town with three historical museums, two beaches, and the Whitney and Thayer Woods Reservation for hiking and recreation. Check out the South Shore Music Service where many visitors come to enjoy great concerts of all kinds of genres of music. Nearby in Hull, you can visit the Paragon Carousel, one of the oldest carousels in existence. Next door, in Hingham, relax at the Wompatuck State Park. 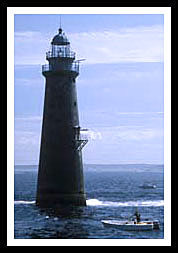 Occasional tours are offered by the Boston Harbor Cruises and Friends Of Boston Harbor Islands which pass by the lighthouse. 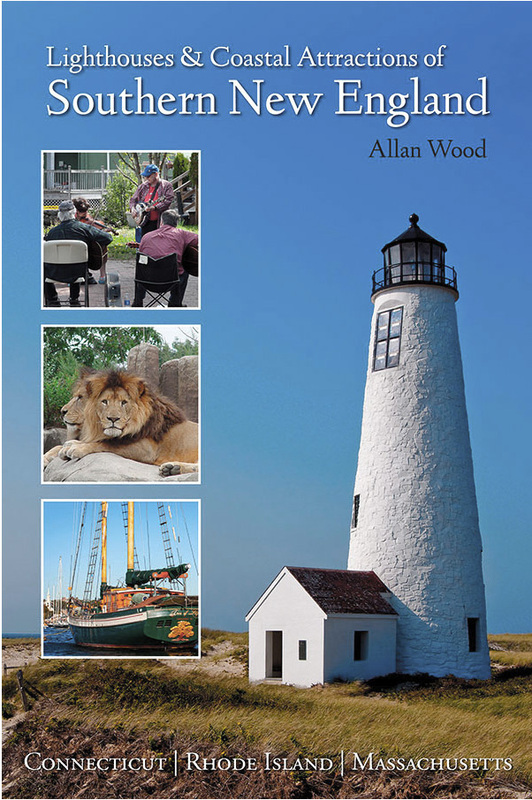 My book, Lighthouses and Coastal Attractions of Southern New England: Connecticut, Rhode Island, and Massachusetts, published by Schiffer Publishing, provides special human interest stories from each of the 92 lighthouses, along with plenty of indoor and outdoor coastal attractions and tours you can explore, with contact info to plan your vacation. 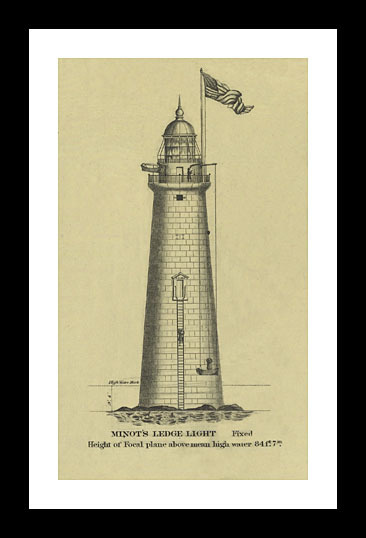 In the book you'll find local stories from all lighthouses in the Boston area region, including more stories about Minot's Ledge light. Yes, it's considered haunted too.